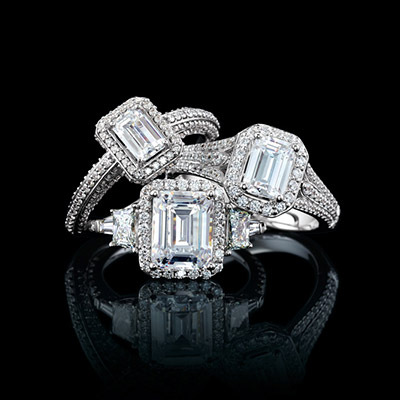 Now Trending: Emerald Cut Engagement Rings - Atlanta Diamond Co. When brides visit us to design their perfect ring, many are choosing unique fancy shape diamond engagement rings. While many brides still love a classic round diamond, diamond shapes are as varied as the women who wear them. At Philadelphia Diamond Co., we are seeing couples opt for princess cut, pear, heart, and emerald shaped diamonds more and more often. Many brides choose emerald cut diamonds for their elegance and vintage-looking beauty. Emerald cut engagement rings are rare and distinctive— which makes sense that powerhouses Beyonce, Reese Witherspoon, and Amal Clooney wear this shape diamond in their engagement rings. Emeralds tend to be set in a simple solitaire setting to showcase the cut of the diamond. Many couples opt for a halo around their emerald cut diamond to accentuate the stone’s beauty and vintage flair. Only roughly 3% of the cut diamonds are emerald cut, which makes this shape more rare than other options. With their elongated table, budget-minded shoppers might be pleased to learn that the emerald cut diamonds’ elongated shape and larger table makes this shape appear larger than diamonds of the same carat size. We would love to help you see if a an elegant emerald shape diamond is for you! At Atlanta Diamond Company, our custom jewelry studio is known for unique bridal jewelry designs, quality certified diamonds, and knowledgeable Graduate Gemologists. Book an appointment today to consult with our team on designing the perfect engagement ring.